The Camelbak Circuit Vest has been my go to running vest this summer. It is a simple, light weight running pack that has very basic features, yet gets the job done for stashing food and staying hydrated. 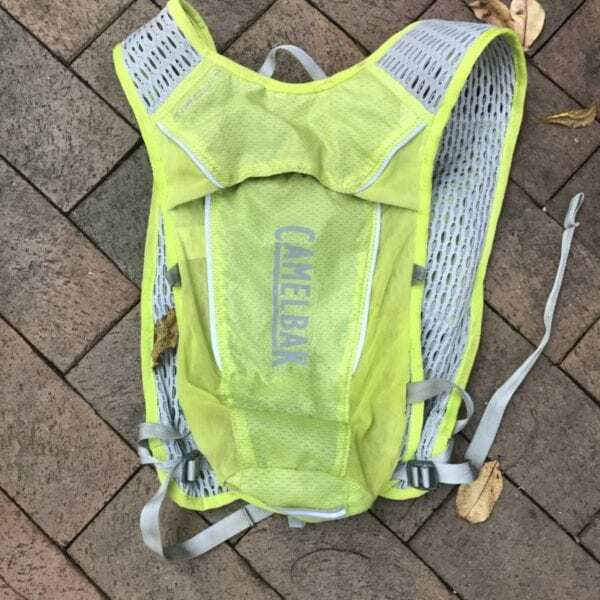 I used the Camelbak Circuit Vest on a 50 miler, 50K, trail marathon and multiple training runs. In total, I have probably worn this pack for a minimum of 150 hours. What you will notice first when placing the Camelbak Circuit Vest on your back is the weight and feel. The pack weighs a mere 6 oz, an upgrade from the original Circuit Vest. The pack features two adjustable chest straps that are easy to snap together while on the move. The straps slide up and down the track with 6 different zones, or areas along the track that are sewn to prevent un-wanted sliding. To move from zone to zone, simply slip the straps anchor from under the strap. This usually needs to be done when at rest. I have the sternum strap in the 2nd position and the lower strap in the 5th position and have felt the need to move them while on a run. There are side adjustment straps that help you fine tune the fit as your bladder volume decreases. The side straps are very comfortable and easy to move with one hand. The one downside of these straps is that they loosen easily, which leads to regular adjusting of each strap. 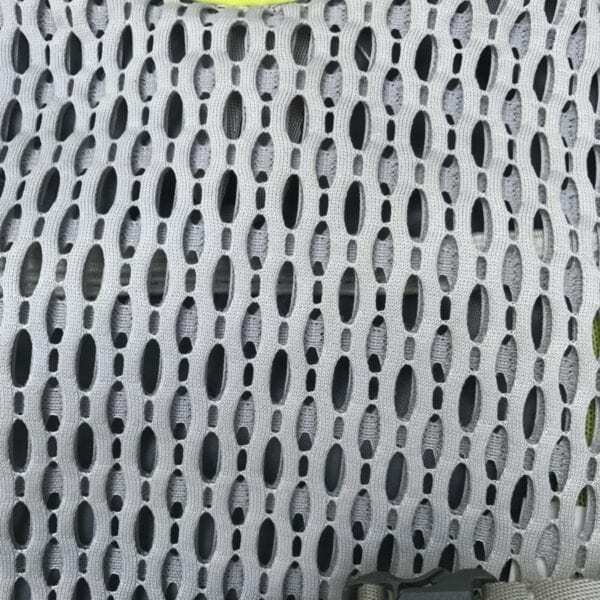 The back panel and the straps features ventilated 3D Mesh. The mesh is not only comfortable on bare skin, if wearing a tank top or shirtless, but it is extremely breathable. 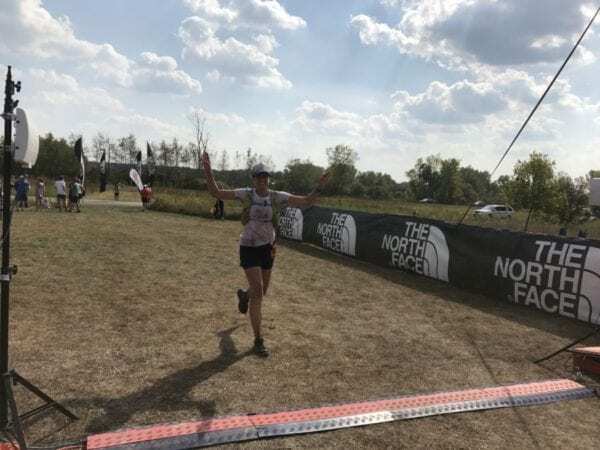 The pack dries quickly and I feel like it helped me from over heating on a recent hot 50 miler, where temps soared to the upper 80s and humidity neared 90%. The shoulder straps transition from the mesh to a soft, almost terry cloth like fabric in the front and along the neck of the pack, which absorbs moisture and never chafes. 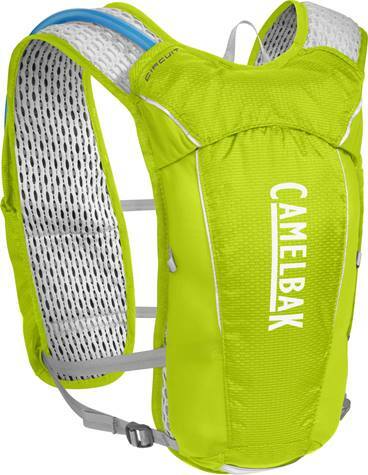 The gear capacity for the Camelback Circuit Vest is listed as 3.5L or 200 cu inches. When the rear compartment is filled with the included 1.5L (or 50 oz) bladder, there is still room to stash gear. Unless the forecast called for 85F and sun all day, I typically stashed a Buff, my Patagonia Houdini jacket, pair of gloves, and maybe even a long sleeve for longer or high altitude adventures. All of this gear sat on the outside of the pack. 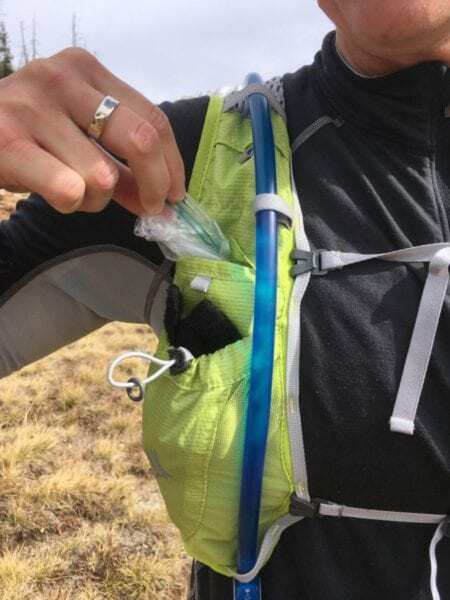 This wasn’t an issue for self supported runs, but would be a pain during a race for refilling the bladder and having to adjust the contents of the pack after pulling out the bladder out to fill. Fully loaded for a fall trail run with a mixture of weather. 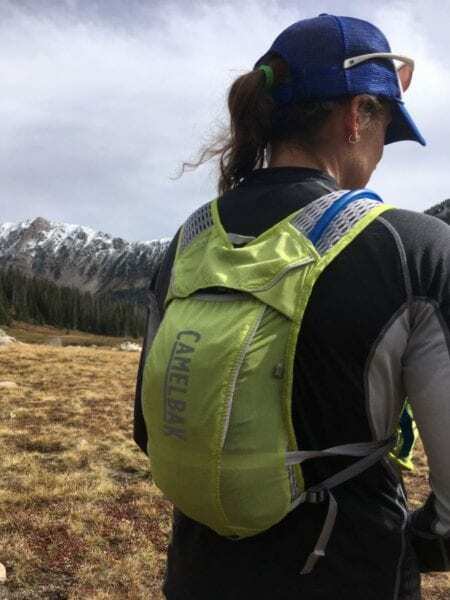 This pack is designed to be the lightest, no frills option in the Camelbak line up and there are several other offerings if you prefer separate zippered compartments for an added price and weight. The simple design was actually easier for me to remember where my gear was located, less hidden zippers means you don’t think as hard as to where you stashed an item. 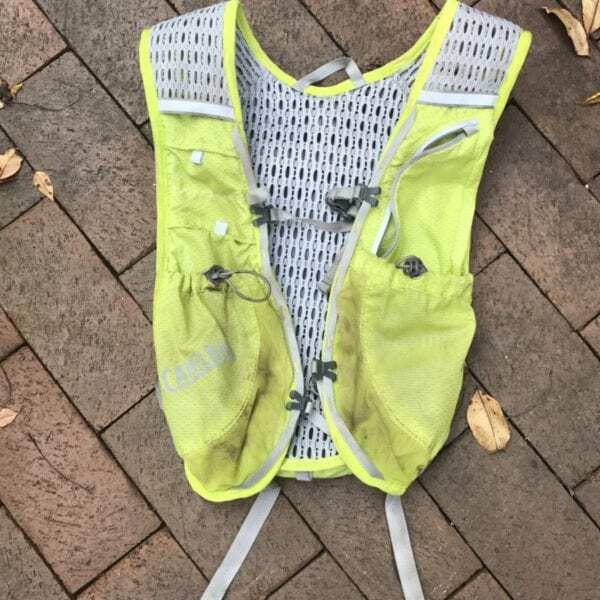 The Camelbak Circuit Vest got a little dirty at a recent 50 miler; fortunately, it is easy to clean in the wash or by hand. 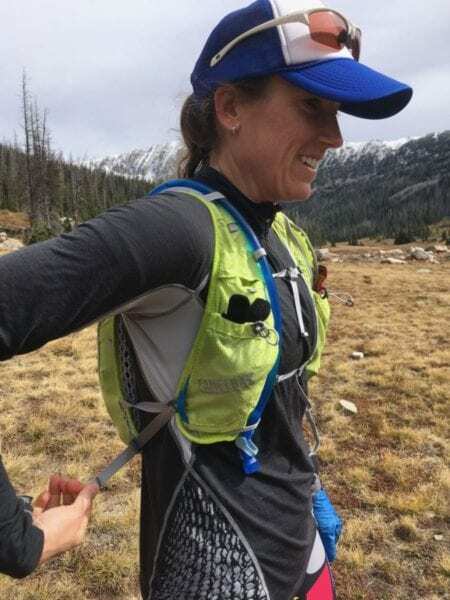 The Camelbak Circuit Vest features 2 large front pockets that can each accommodate bottles; I tested out Salomon and Hydrapak soft flasks and found that they were easy to cram in and out of the pockets. 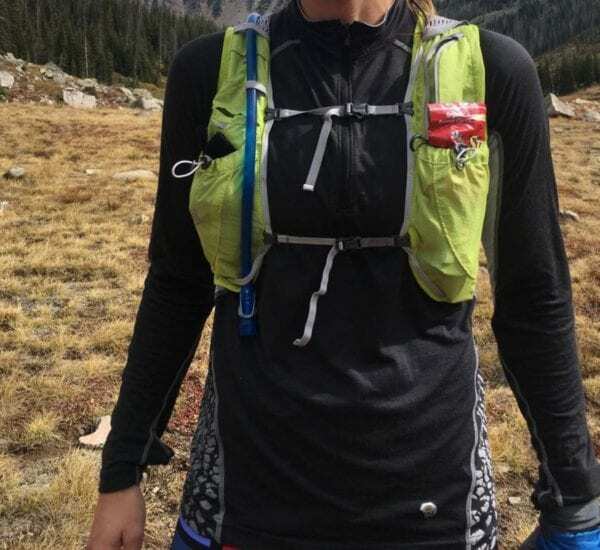 On longer races or training runs, I used one pocket for a bottle and the second for food. The pockets are large enough to fit several packets of Honey Stinger chews, gels, waffles, etc. On the left shoulder strap, there is a waterproof zippered pocket that easily fits your cell phone or other items you want to keep dry. On the right side, there are two small un-zippered pockets that are ideal for salt tabs, package of chews. I often dedicated one pocket to separate and stash my trash. The top pocket measures approximately 2″x3″ and the bottom pocket 4″x4″. Each Camelbak Circuit Vest comes with Camelbaks’ improved Crux hydration bladder which has been redesigned to deliver more water with each sip and includes a handle to improve filling. The Crux is easier to fill, but when you use hydration mixes the lid can be difficult to get started, especially after running for many hours. It can also be a challenge to get the seal lined up to ensure that the lid is closed. Unfortunately, I usually do this myself because sometimes aid station volunteers are unfamiliar with how precise you have to be. If I don’t get it right, I can only blame myself for having a wet back. The updated on/off lever is an upgrade as well and doesn’t leak. The hose of my new bladder feels less pliable and is more difficult to stash under the sternum strap, which is my preferred location. I assume that this will improve with more time. The Circuit Vest does have a small blue bungee tab on the right side of the pack to house the hose. To remove or fill the bladder, simply pull open the elastic on the top of the back panel. The envelope style at the rear of the pack makes it easy to reach in and out of the pack and slide the bladder back into place. Simply hook the top of the bladder on the inside loop and cinch the side straps of your pack and away you go. The Camelbak Circuit Vest really exceeded my expectations. 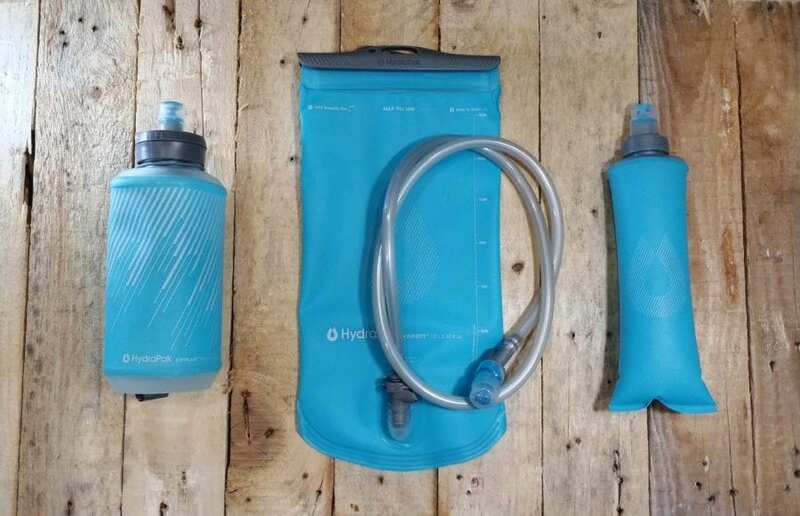 It is lightweight, breathable, has enough storage for most races I enter, and provides ample hydration options with the included bladder or bottles in the front. 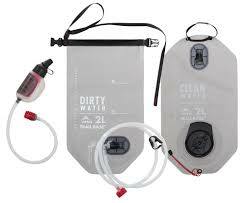 The Circuit Vest doesn’t slide on your back and there is very little audible water sloshing even with a full bladder. 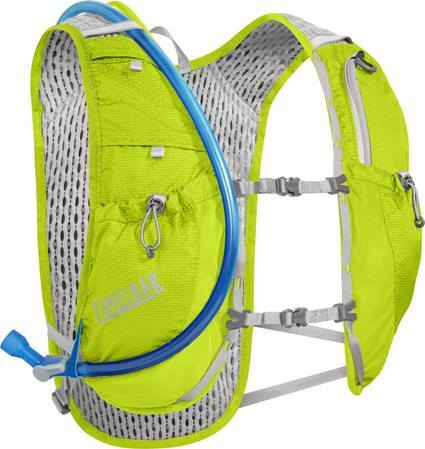 The vest is also a bargain at $90 and comes with a hydration reservoir.